All across the country there are millions of people cutting the cord. They’re dumping their cable TV and satellite television subscriptions for alternatives they hope will cost them significantly less. As much as I call myself a cheapskate, I haven’t made that cut yet. I know that dumping our satellite TV subscription would save us more than $800 a year. So why have I not done it yet? When Michelle wrote about cancelling cable a few years ago, I was interested. But the more I researched it, the more I started to question whether it was right for us. There are actually several reasons why we’re still subscribing to satellite instead of switching to a digital antenna or relying on services like Netflix and HuluPlus. We can’t get the digital channels where we live. We’ve spent a lot of time online researching digital antennas and talking to those who know a bit about them. We live in a wooded area more than 60 miles from most of the transmitters in our area. Even if we put up a powerful (and expensive), multidirectional antenna, we would still have trouble receiving our local channels. And then there would be a series of other channels we watch regularly that would still not be available to us. We can’t switch to basic cable either. I would be thrilled to have a much cheaper basic cable television package with just a dozen or so channels, but unfortunately, that isn’t an option for us either, as cable television is not available where we live. Our internet couldn’t handle the switch. A lot of folks who decide cutting the cord is right for them have access to reliable high-speed internet. They can easily stream television shows and movies online at home instead of paying for cable or satellite. We live in such a rural area, that they only real option for internet is satellite internet. Satellite internet is expensive, comes with limiting data caps, is sometimes unreliable, and much slower than what folks in big cities can access. We need to make sure that the internet bandwidth we use goes to things like my husband’s work, producing this website, and our kids’ school work. Movie and television streaming is a rarity for us because we have to make sure we accommodate the more important stuff first. I’m not convinced it would be as big of a savings as people say. Cutting the cord comes with its own costs if you’re planning to still watch your television. That means money spent on antennas and cabling, antenna-ready televisions, and subscriptions to online streaming services. It would be very easy to let subscriptions to services like Netflix, Amazon Prime, HuluPlus and Sling Television quickly add up to as much money as a cable TV subscription would cost. There’s extra money to invest if you want to be able to record programming with a DVR, and of course, technology always changes, so the investment must continue. If you like sports, it’s very difficult to find any way to watch sports programming without cable or satellite. I know folks who say they just go to their favorite sports bar to watch, but that comes with a price, too. I want to keep television watching simple. I often use television as a means to relax. That means I just want to plop on the couch and press a button and be entertained. That does not mean I want to figure out which service I want to use, which remote works with it, and having to wait for things to download. I like that watching television is a mindless activity. I’d like to keep it that way. The way we watch television is changing. I’m convinced there will be big changes in the future of the broadcasting industry. As more people switch to over-the-air digital antennas and online streaming, internet companies will start to raise their prices for services. More internet providers will begin enforcing data caps on users. Cable and satellite providers will begin to feel the pressure to offer ala carte options so that users can choose exactly which channels they’d like to receive. I’m watching and waiting to see what happens. It could get worse for cord cutters before it gets better. It’s something we enjoy and we budget for it. Ultimately, we find that when you divide the amount we pay for satellite each month by the number of hours we watch television, the cost is worth it to us. We live in the woods, where the winter weather sometimes keep us at home for stretches of time. And the truth is, we just really like watching local news, weather, and our favorite television shows and sporting events. We regularly call our satellite company to negotiate lower rates, and we budget for the expense because it’s something we enjoy. We know we could just quit watching television and save a lot of money, but we don’t want to do that. I’m not saying we will never cut the cord. I know that circumstances can change. If our television habits change, or our options for internet and digital antennas change, I could see making the switch to save money. Until then, I’ll continue to do what works best for our family. That’s what frugality and saving money is all about. You cut corners where you can to afford the things you need and want. What about you? Have you cut the cord? Why or why not? 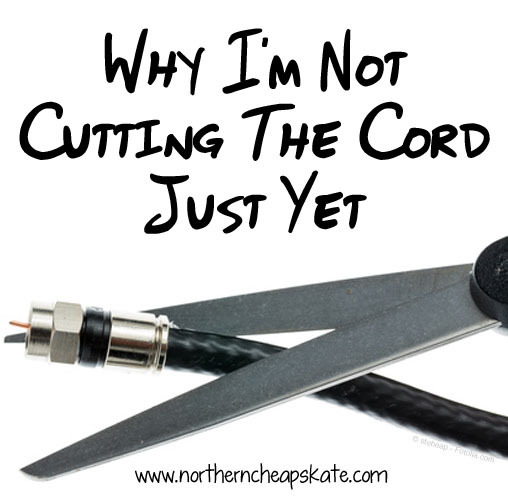 If you have money in your budget and enjoy it, then it doesn’t make much sense to cut the cord! I haven’t had cable since I lived in the dorms (it was included) and don’t miss it much. For a couple of years I had VERY basic cable (2-13, PBS, a few stations in other languages) because I wasn’t able to get wifi without it. Recently Time Warner changed their packages in my area so I ONLY have to pay for wifi now. Honestly, I kind of miss being able to just turn on the TV and watch Jeapordy or local news, etc. I really, really, really want to get a digital antenna soon so I can watch presidential candidate debates (I’m a politics nerd) but am a bit overwhelmed by all the options. Sometimes I think I would be just fine without any TV… but then when it comes to things like the news, or weather, or I’m snowed in, then I think, “Nope.” I’d love to have one of those very basic cable plans, as most of what I like to watch is on those stations, anyway, and it would save a bunch of money. Maybe the satellite companies will figure out they could be making a lot more money if they offered cheaper packages. Thanks for the encouragement, Cheyanne! Love your profile pic!